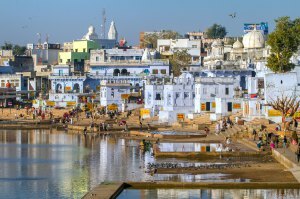 The Indian city of Rajasthan, Pushkar is known for being a high place of pilgrimage of Hinduism, with a great temple dedicated to the god Brahma, and is located on the shores of the lake of the same name. With a population of about 15,000, Pushkar also hosts one of the largest camel fair in Asia every year in October / November. Yet, outside of this time, the city offers a peaceful haven for visitors, easy to discover on foot, and rich with over 400 temples, old houses, and enjoying a tranquil atmosphere. Do not miss to go around the sacred lake, with the 52 ghats which allow to reach it, preferably at the time of the sunset; To climb up the hills to enjoy the exceptional view of the surroundings; To stroll through the fields of flowers and gardens near the village, where the peasants will be happy to show you their plantations; To visit the temple of Jagatpita Brahma Mandir, dedicated to Brahma. Note: Pushkar, sacred city, is entirely vegan. You will not find there meat, cheese, eggs but also no alcohol. No worries, however, the many restaurants in Pushkar will offer you a unique vegetarian dining experience. The inhabitants of the city are very welcoming and you will easily meet. Access to Pushkar by train and then rickshaw from Jaipur, but also by bus (4 hours of travel for 140 km). In the city, there is easy walking, but you can also borrow a rickshaw or a taxi, or rent a motorbike.